Last month, Mcvities expanded their breakfast biscuits range with their Breakfast Oaty Breaks at around the same time Quaker Oats announced their new Granola line-up of crunchy cereals. A crunchy breakfast certainly seems to be the trend at the moment, with convenience always the crux of the operation, but are the line expansions any good – and can IBS sufferers even try them? Is it a case of convenience over nutrition for breakfast biscuits? Kerry Owens, head of Healthier at United Biscuits, says that the Mcvities upgrade provides a “tasty”, “wholesome”, “hearty” and “satisfying” breakfast, as well as providing the consumer with a wealth of vitamins, including vitamin B, D and a good helping of iron. Despite the Oaty Breaks health claims, however, these are a poor start to the day which provide empty calories and certainly require more than the 2 allotted biscuits to give anything at all “satisfying”. Just take a look at the ingredients below for the Golden Syrup Oaty Breaks type. Considering the fact that a bowl of porridge contains 100% porridge oats, you’d most certainly be better off with that for a hearty breakfast than 34% rolled oats and the rest flour, oil, added vitamins (fortified) and heaps of sugar. They’re also not suitable for those with a wheat intolerance (high amounts of wheat flour), nor are they any good for IBS sufferers due to the high concentration of fats and sugars in such a small, dense product. Will granola fare any better for IBS sufferers? GRANOLA (WHOLE GRAIN ROLLED OATS, WHOLE GRAIN ROLLED WHEAT, SUGAR, BROWN RICE CRISPS [WHOLE GRAIN BROWN RICE, SUGAR, BARLEY MALT, SALT], CANOLA OIL, WHEY, CORN STARCH, POLYDEXTROSE, MOLASSES, NONFAT DRY MILK, WHEY PROTEIN CONCENTRATE, NATURAL FLAVOR, HONEY, SODIUM BICARBONATE, SALT, DRIED COCONUT, CINNAMON, SUNFLOWER OIL), ALMONDS, DRIED CRANBERRIES, SUGAR, GLYCERINE, OAT FLOUR, SUNFLOWER OIL. Unfortunately for us, the crunchier the cereal, generally means the more it has been piled high with non-digestible carbohydrates such as starches and sugar; the starch creates a film over the pregelatinised clusters to prevent the milk from penetrating the cereal, and the sugar provides a crispiness to the top layer. Dextrins such as the polydextrose are also sprayed on the surface of the cereal after processing to provide an additional crisp barrier. Learn more about how granola keeps the crunch here. Although these non-digestible carbs up the fibre content noticeably, the wholesome aspect of the granola is severely downgraded with the added nasties. If high fibre, filling cereals are your preference, a bowl of wholegrain porridge, Original Weetabix or a no-sugar muesli should do the same job with fewer empty calories. If it’s a crunch you’re after, simply add unprocessed nuts or seeds. Which is better – breakfast biscuits or crunchy granola? The most important thing to note with breakfast products is the sugar… McVities Oaty Breaks contains 24% sugar (3 teaspoons of sugar) per 50g serving whilst Quaker’s Warm & Crunchy Granola provides 15% sugar (less than 2 teaspoons of sugar) per 50g serving. Quaker also provides more fibre from fruits, nuts and wholegrains. If it was a choice, I’d opt for the Quaker Oats Granola… although I’ve publicly displayed my dislike for them as a ‘health brand’ company. 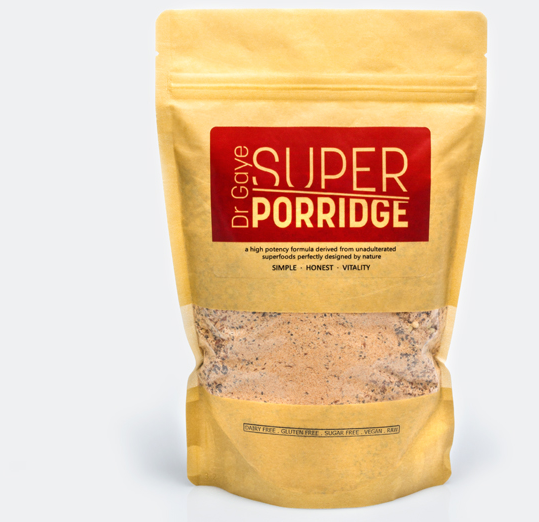 If it’s a warm, healthy and hearty breakfast you’re looking for, try Dr Gaye’s Super Porridge – super because it’s made specially for those who have digestive issues. Packed full of raw flaxseeds, buckwheat and mulberries (all proven to cause minimal digestive disruption), there are no nasty surprises or consequences of eating this absolutely gorgeous porridge. If you need a crunchy cereal but don’t trust any shopbought granolas (because why would you? they’re all sugar-filled!) then try my healthy granola recipe here made with greatly digestible buckwheat. I like making my own granola because it means I can throw it whatever I like and not be contending with multiple additives usually supplied in the processing part of shopbought varieties. Try it yourself and see if you notice the difference!